Will Gideon was born in 1931 in Takoma Park, Maryland. He enlisted in the U.S. Air Force on February 8, 1952, and completed basic training at Sampson AFB, New York, in June 1952. A3C Gideon then served on the Alert Crew with the 3575th Pilot Training Wing at Vance AFB, Oklahoma, from June to December 1952, and he then attended Pre-Flight Training at Lackland AFB, Texas, from December 1952 to March 1953. He was then accepted into the Aviation Cadet Program and was commissioned a 2d Lt in the U.S. Air Force and awarded his pilot wings at James Connally AFB, Texas, in March 1954, followed by F-86 Sabre Combat Crew Training from March to June 1954. His first flying assignment was as an F-80 Shooting Star, F-86, and F-100 Super Sabre pilot with the 450th Fighter Day Squadron at Foster AFB, Texas, from June 1954 to November 1957, and then as an F-100 pilot with the 723rd Tactical Fighter Squadron at Foster from November 1957 to August 1958. Capt Gideon next served as an F-100 pilot with the 23rd Tactical Fighter Squadron of the 36th Tactical Fighter Wing at Bitburg AB, West Germany, from August 1958 to April 1962, during which time he flew the solo position for the U.S. Air Forces in Europe Aerial Demonstration Team, "The Skyblazers", from November 1960 to March 1962. He then completed F-105 Thunderchief Combat Crew Training and served as an F-105 instructor pilot with the 4526th Combat Crew Training Squadron at Nellis AFB, Nevada, from May 1962 to August 1965, followed by service as an F-105 pilot with the 67th Tactical Fighter Squadron at Kadena AB, Okinawa, from August 1965 until he was forced to eject over North Vietnam and was taken as a Prisoner of War on August 7, 1966. After spending 2,402 days in captivity, LtCol Gideon was released during Operation Homecoming on March 4, 1973. He was briefly hospitalized to recover from his injuries at Wright Patterson AFB, Ohio, and then attended Air War College at Maxwell AFB, Alabama, from August 1973 to July 1974. 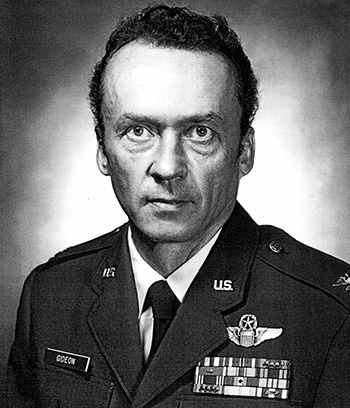 Col Gideon received an Air Force Institute of Technology assignment to complete his bachelor's degree at the University of Nebraska from July 1974 to June 1976, and then served as Chief of Supply for the 437th Supply Squadron and Deputy Commander for Resource Management for the 437th Airlift Wing at Charleston AFB, South Carolina, from June 1976 until his retirement from the Air Force on June 1, 1983. 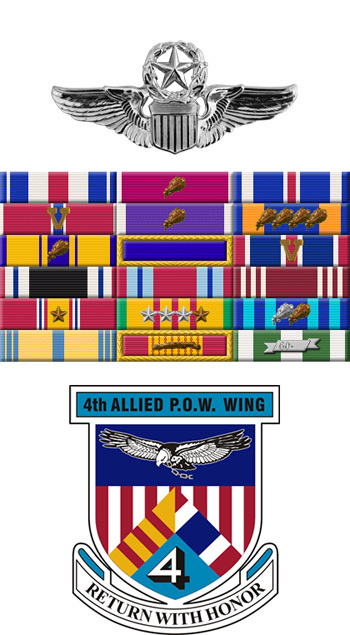 Major Willard S. Gideon distinguished himself by gallantry in connection with military operations against an opposing armed force over North Vietnam on 7 August 1966. On that date, Major Gideon, pilot of an F-105 aircraft, participated in the destruction of a major petroleum storage facility in North Vietnam. Demonstrating superior skill, aggressiveness and determination, he pressed his attack delivering all ordnance on target while evading surface-to-air missiles that were launched against him, as well as extremely heavy anti-aircraft fire. By his gallantry and devotion to duty, Major Gideon has reflected great credit upon himself and the United States Air Force.